Tropical storm Agatha hit Central America in the last week of May, causing landslides, killing hundreds of people and opening a sinkhole in Guatemala’s capital city. 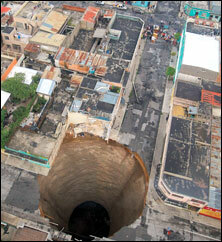 The 18m-wide, 60mdeep sinkhole gobbled a three-storey building. Geologists are yet to ascertain the cause, but some say a ruptured sewer line may have been dissolving the underground rock for long. The flood caused by Agatha made the weak topsoil collapse. Botswana’s bushmen sued the government for denying them access to a well, their only source of water in the Kalahari national park, for no reason. In 2002, the government evicted them from their ancestral land in the park. In 2006, a court said it is unconstitutional. The government allowed them to return but denied access to the well. The Nile Perch stock in Lake Victoria is rising after Kenya and Tanzania banned foreign fishers from fishing in their waters in 2008. The fish is a major foreign exchange earner for the countries. As Uganda and Rwanda promote gorilla tourism, scientists warned proximity to tourists is threatening the great ape’s health and disrupting the way it feeds and interacts with each others. The world is left with roughly 700 mountain gorillas. Zimbabwe banned all diamond exports until gemstones from the government’s Marange fields are certified by the Kimberley Process. The UN body ensures trade in diamonds does not fund violence. It cancelled the certificate in January following complaints of human rights violations at Marange. Israel stormed six ships carrying aid to the Gaza Strip on May 31, killing nine activists and detaining 700 from 35 countries. Since 2006 Israel has limited the import of goods to the Hamas-controlled territory. A pulp and paper mill on the shore of Lake Baikal has caused a rift between Russia’s president Dmitry Medvedev and prime minister Vladimir Putin who wants to reopen the mill. At a meeting, Medvedev said the mill poisons the world’s largest freshwater lake and Putin’s decision is not final. Several EU countries said they won’t be able to fund an international nuclear fusion reactor under construction in France. EU bears 45 per cent of the US $19 billion global initiative. Nuclear fusion is the holy grail of abundant clean energy. Scientists are yet to exploit it commercially. International oil trader Trafigura faces criminal charges in the Netherlands for trying to dump toxic waste in Amsterdam in 2006. Trafigura eventually dumped the waste in Ivory Coast after the Amsterdam authorities asked for a higher price for the disposal. The waste dumped in 2006 killed scores of people and sickened 30,000 in Ivory Coast. The Icelandic volcano that caused havoc for air travellers across Europe for a month has stopped erupting. Novo Nordisk, the global leader in the supply of antidiabetes drug insulin, is pulling its medication out of Greece following a government decree asking a 25 per cent cut in the price of the medicine. Greece wants to slash its medical bill to reduce its crippling debt. Fast food chain McDonald’s recalled 12 million glasses promoting the new Shrek movie from across the US. The painted designs on them contained the metal cadmium, a carcinogen. US scientists said they have developed a vaccine to prevent breast cancer and will conduct its clinical trials on humans in two years. Trade negotiators signed the Geneva Agreement on Trade in Bananas, putting an end to a protracted trade dispute. The EU, which has been offering preferential treatment to its former colonies in Africa, will now slash its tariff on bananas from Colombia, Peru and six Central American countries. To prevent the collapse of global fisheries, about 20 million fishers worldwide would have to find other works by 2050, according to the UN Environmental Program. About 520 million, or 8 per cent of the world’s population, is economically dependent on fishing.